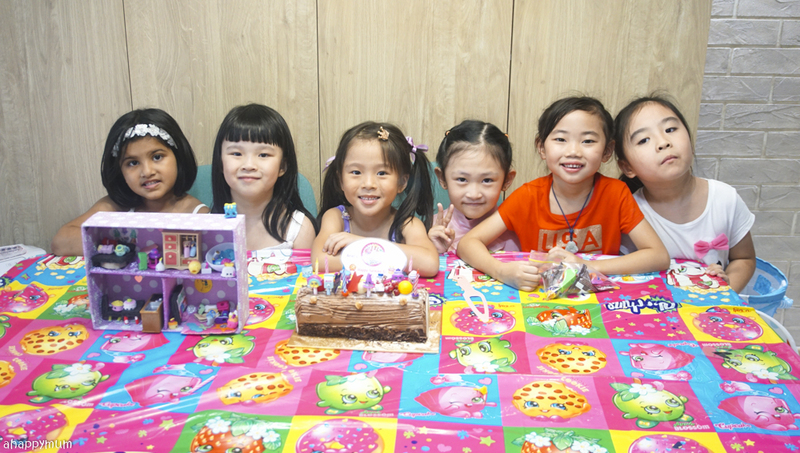 When I asked the girls what birthday themes they would like for their parties, they didn't take too long to decide. 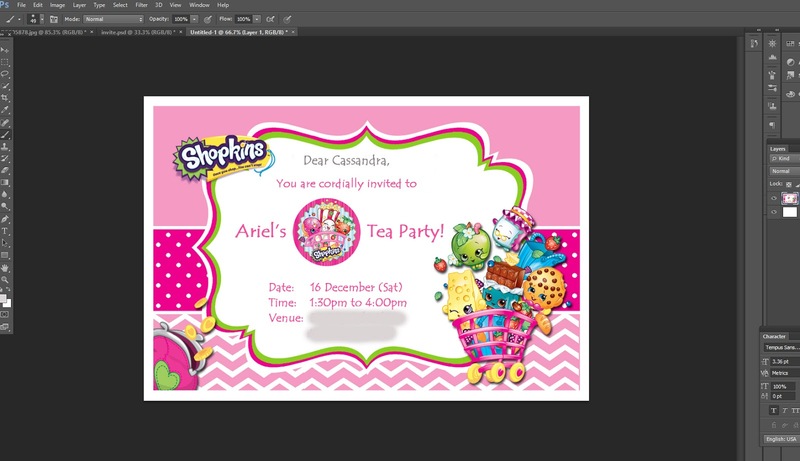 The big sister wanted a Sylvanian themed one (read all about her Sylvanian themed tea party here) while the little sister would like a Shopkins themed one. Shopkins? Yup, the one word that was foreign to me not too long ago. 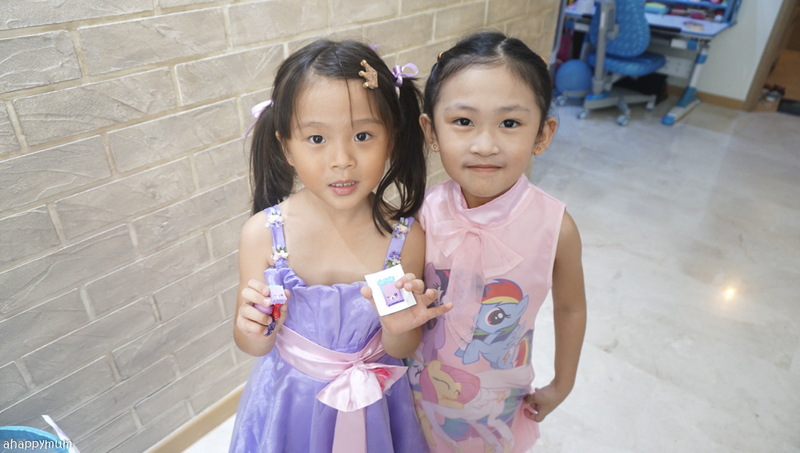 Thanks to her classmates, Netflix, colouring/story books and a huge display of Shopkins in every Kiddy Palace we passed by, I soon got acquainted with it. It seemed to me that anything and everything can be a Shopkin so I was pretty thankful because that meant it wouldn't be hard for me to come up with the party decorations and games. 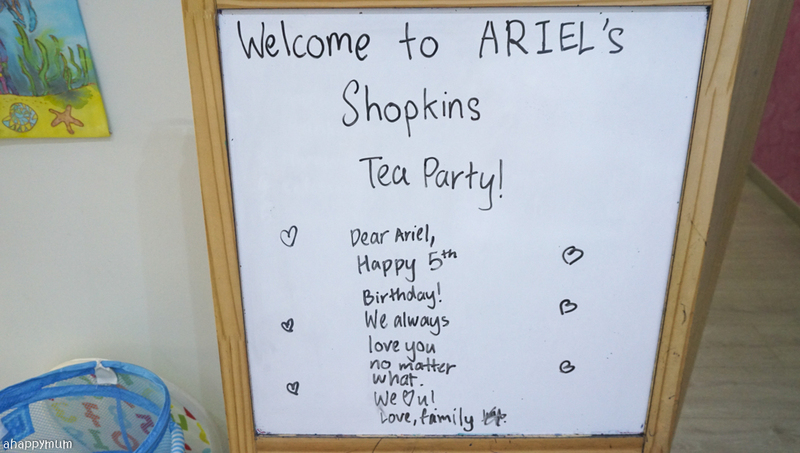 In this post, I'm sharing all about Ariel's 5th birthday and how she had a blast at her fun-filled Shopkins Tea Party! Woohoo, yes, another birthday post to share! In wanting to keep the party cosy and intimate, we decided to invite just five of her good friends from school. Since it was her birthday, I gave her the freedom in deciding who to invite and it wasn't long before we did up a simple invitation and passed to them. 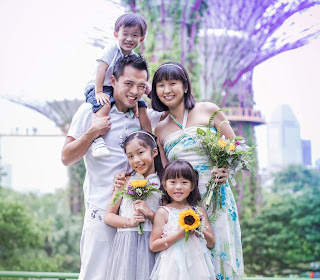 To our joy, all of them RSVP-ed saying that they would love to come! I was worried that they would be busy or go away on holiday since it was in mid-December so it was really a relief knowing that things could go as planned. I had to deal with something important from the start and that was to help the big sister determine her role in this party. 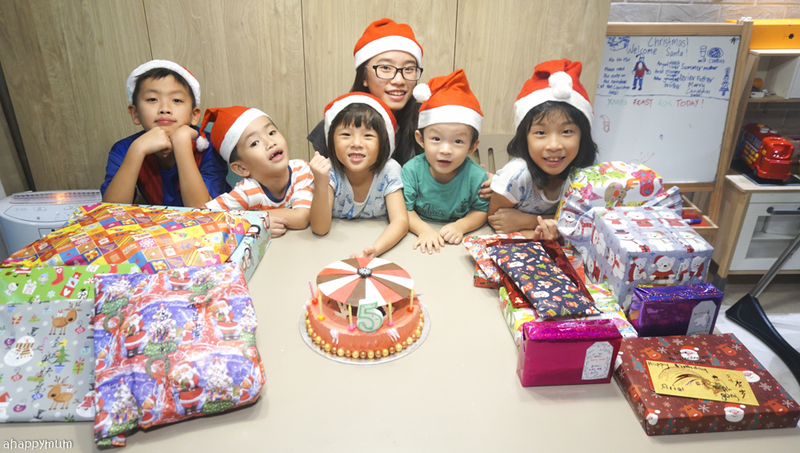 Initially, she was adamant on wanting to join in all the games as a participant because in her words "Meimei could play all the games during my birthday with my friends, I also want to play with hers." Fair enough, right? So, it was a little tough trying to explain that some of the games were more suited for the younger kids and since she was three years older, I suggested that she could become the game master instead - and she eventually took on that role with glee. In fact, she helped me to come up with a list of activities and was in charge of writing them down so we couldn't forget. It was really nice to see that she was able to see the big picture and be willing to be my most able assistant on the day itself. As for our wall decor, I kept it simple and adapted the template I used for the Sylvanian party. 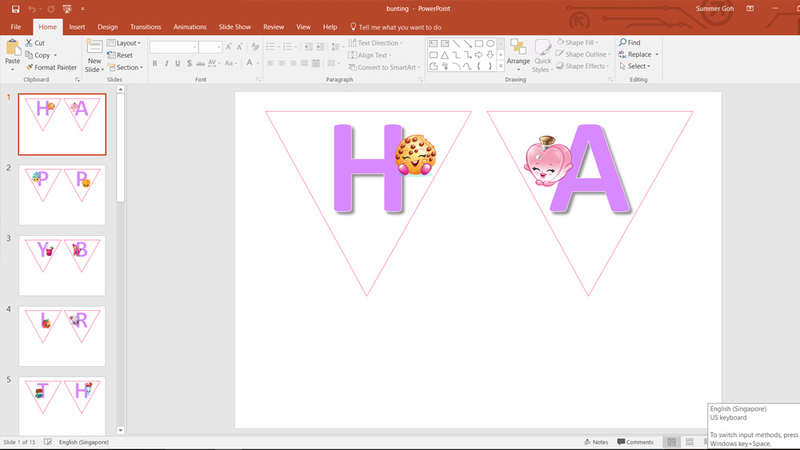 All I did was to search for images of Shopkins and superimpose them onto the letters that I wanted to print out for the bunting. Ariel wanted to have a drawing game too so I did up game cards and printed them out myself - these include everyday items in the house (which might possibly be a Shopkin, haha). I also printed out some colouring pages because these are always handy to keep the early birds occupied while waiting for everyone to arrive. One of the highlights of our decorations had to be this table centerpiece, which was a Shopkins house we made by ourselves using a cardboard box, wrapping paper, foam, straws, empty containers, felt etc. It took us quite some time to make it two-tiered but we did it eventually! Ariel even designed and drew things like a painting, a clock, a TV screen for the house. 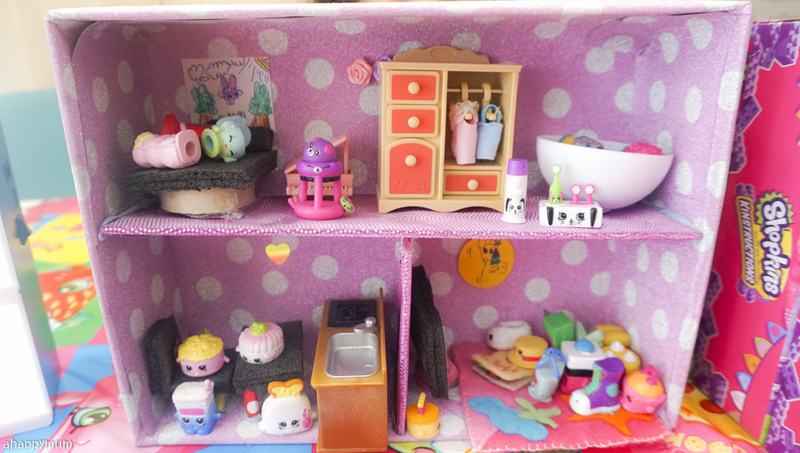 We also borrowed some furniture pieces from our Sylvanian sets and of course, chose some of our favourite Shopkins to 'stay' in this cute little house. 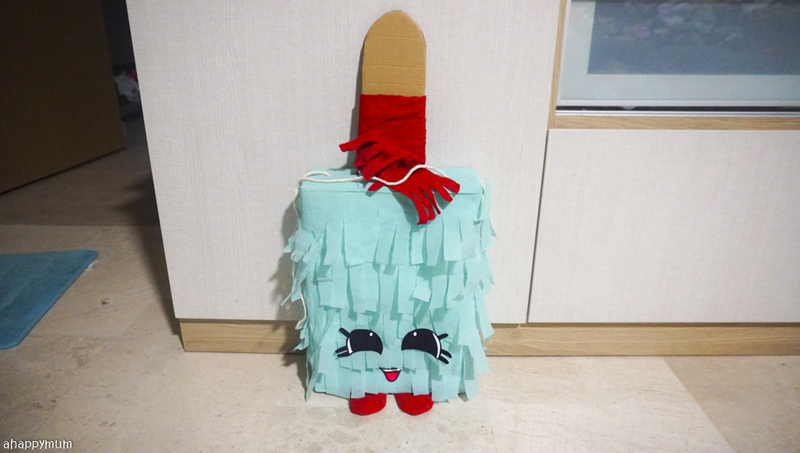 Lastly, I know how much my girl would love to play the pinata on her special day so I did a simple one of Popsi Cool using an empty cereal box, crepe paper, felt, cardboard and old socks. I will share more in a Creativity 521 post when I can, stay tuned for more pictures if you are keen to see how it was done. 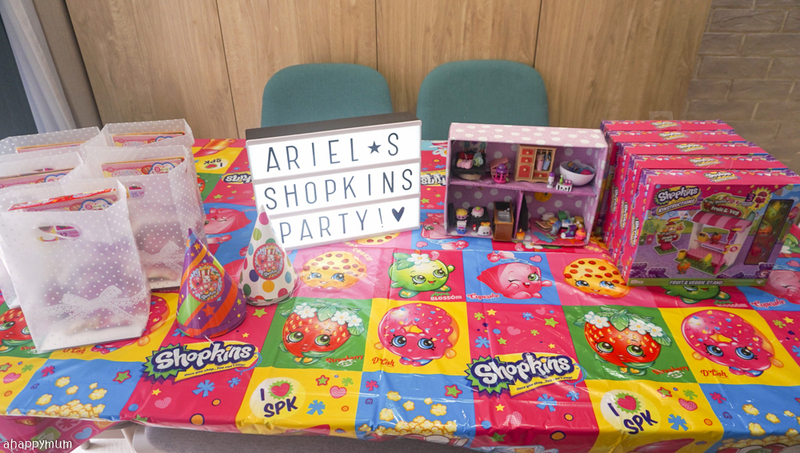 The night before the party, I laid out the Shopkins themed tablecloth and disposable tableware that I bought online (can't seem to find any of them in the party shops here). We put up the lightbox - it's such a great way to teach the kids to spell - and I also printed out round labels to stick onto the party hats. As for the goodie bags, these have to be the most awesome, generous ones we've given away. See below? 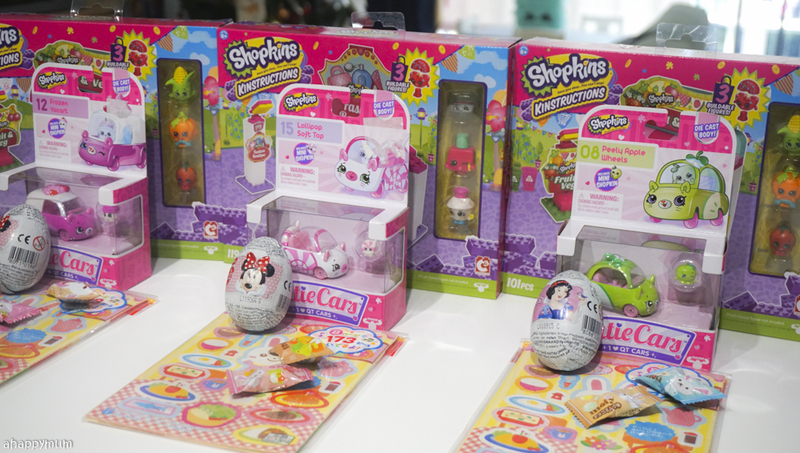 Each pack comes with a Shopkins Cutie Car, a Shopkins Kinstructions with buildable figures and over 100 pieces to put together, a sticker book, a chocolate egg and candy. 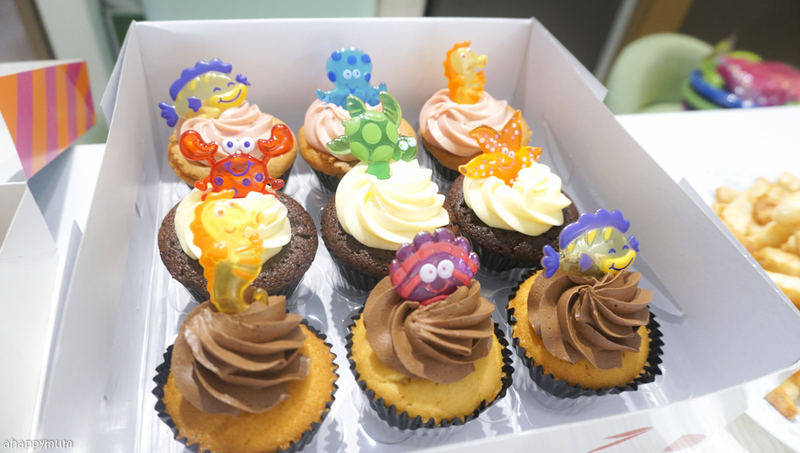 I was happy to see that the guests were thrilled with these party favours and one parent even asked his daughter when he saw the building set "Are you sure this is for you to take home or not?" and was surprised when we said "Of course!" That is the good thing about having a small party, you get to do more, give more and play more! 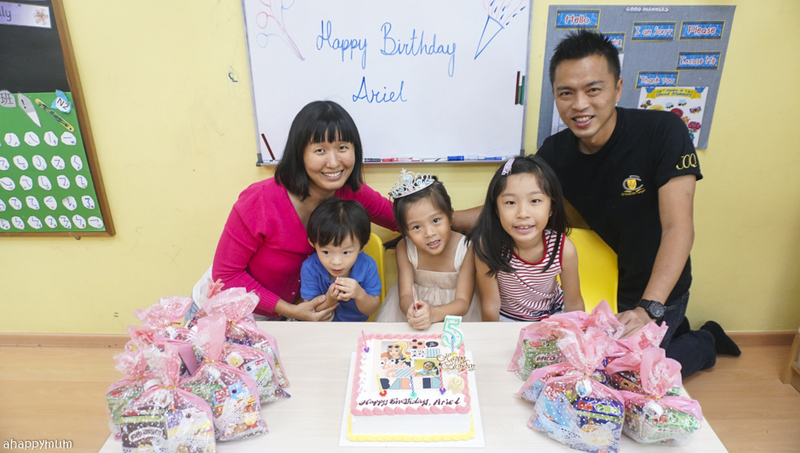 Just like the sister, Ariel did a kind deed on her birthday and that was to ask for donations to SPCA and help her animal friends instead of getting gifts. She was very thrilled whenever her friends or their parents gave her the cash and would happily put into the donation box. 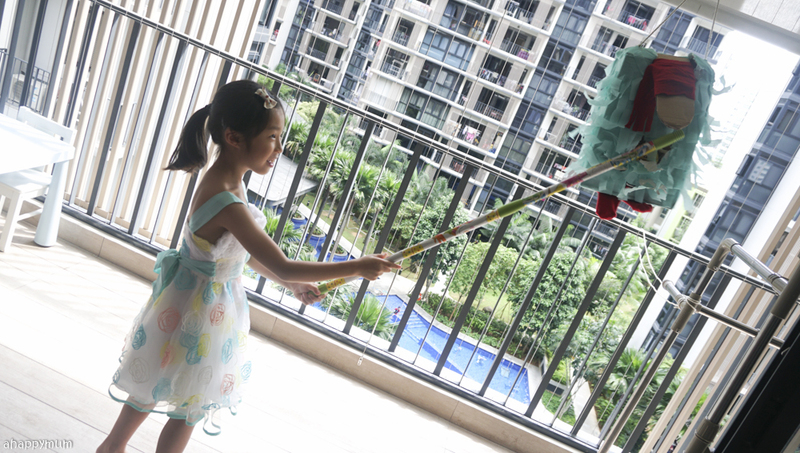 I'm going to share more about our trip down to SPCA, which we did on her actual birthday, and how we gave her a present she has always wanted to reward her for being such a sweet, sensible girl. 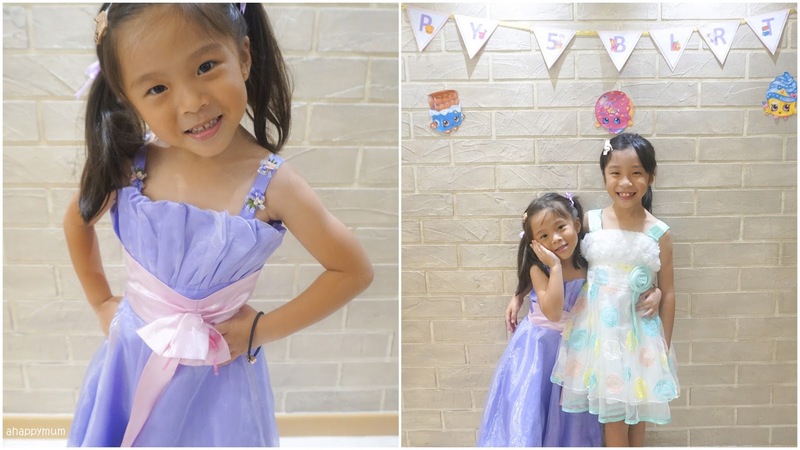 As for the party dresses, we didn't get new ones for the girls but instead ask them to pick what they would like to wear from their wardrobes. Ariel picked out this pretty, purple, princessy dress which fitted her to a tee and I love how happy she looked in it! 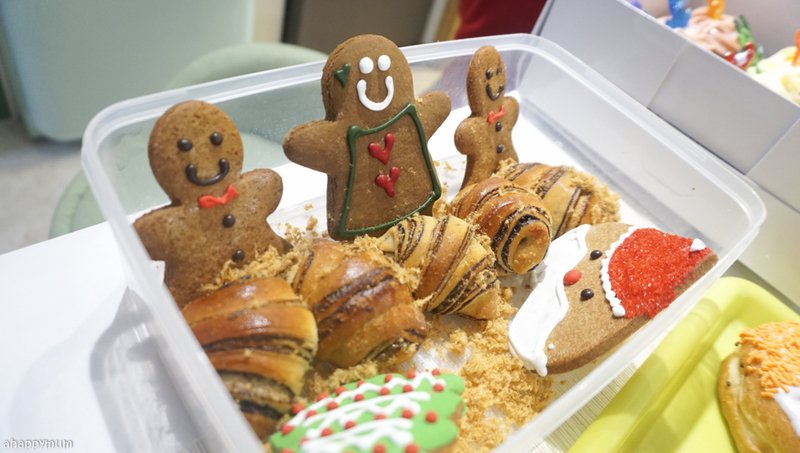 The good thing about organising a tea party is that we don't need to cater or cook up a storm. 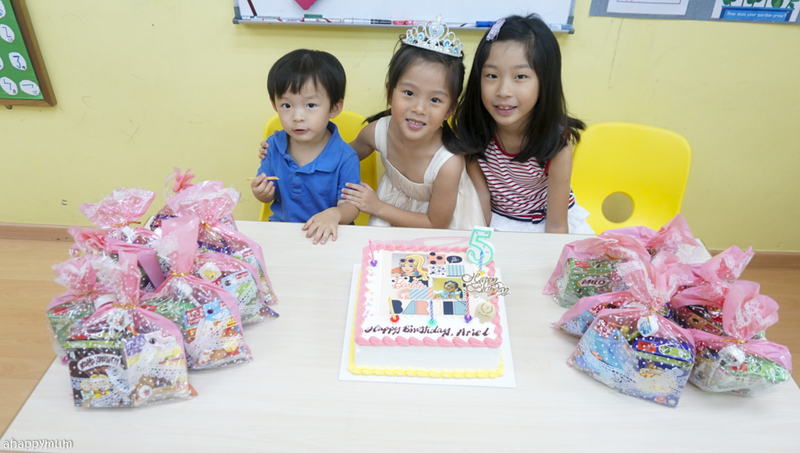 Instead, we asked the birthday girl what kind of food she would like and just topped up from there. 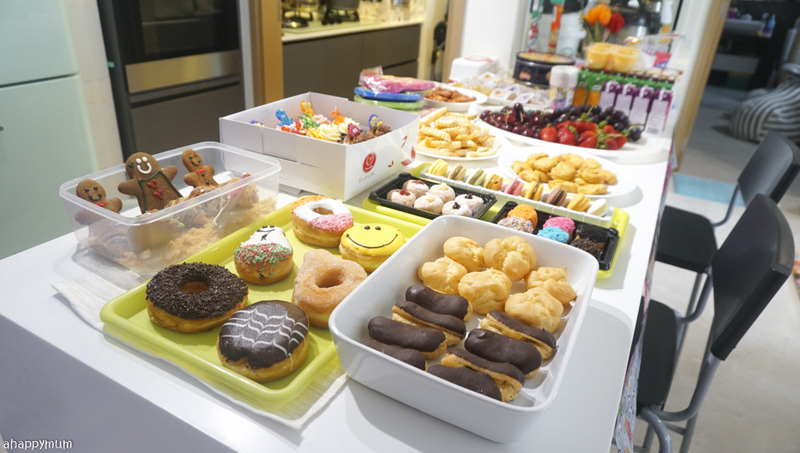 For Ariel's party, we had a variety of treats including donuts, eclairs, cream puffs, croissants, gingerbread cookies, cupcakes, macaroons, cocktail sausages, french fries, nuggets and fresh fruits. Haha yup, definitely an overkill but hey, better to have more than less, right? 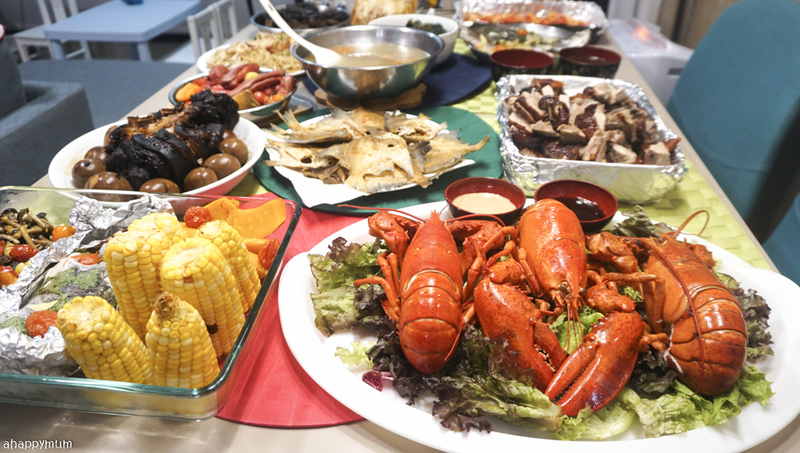 Our guests were pleasantly surprised that there was so much food and so many choices to pick from and some even commented that the food looked too pretty to eat! Now, it's time for the party to begin! First of all, check out this sweet message the big sister wrote for the birthday girl. Yup, so glad I took a picture of it before it got erased as we needed the easel stand and whiteboard for one of the activities. 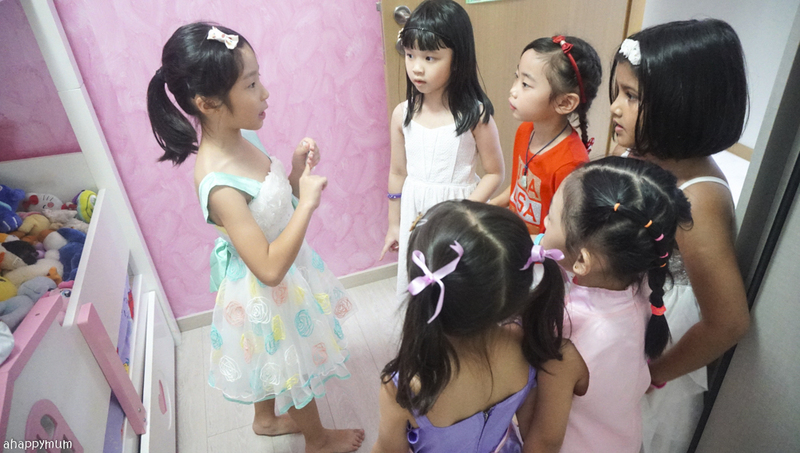 Now, let me tell you all about what we did during the party and how we kept our guests entertained! 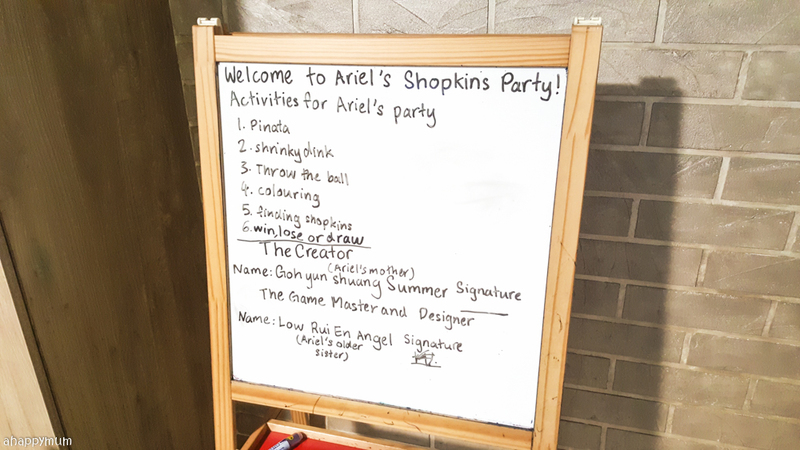 First of all, the kids who arrived first were just to happy to receive a Shopkins wristband and then they proceeded to the colouring station. 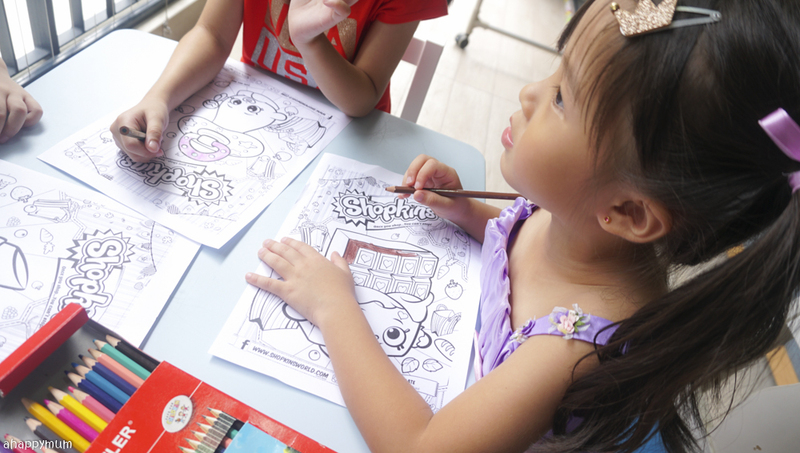 I know I still love colouring as an adult and I hope my kids will always find the joy in this simple but timeless activity too. 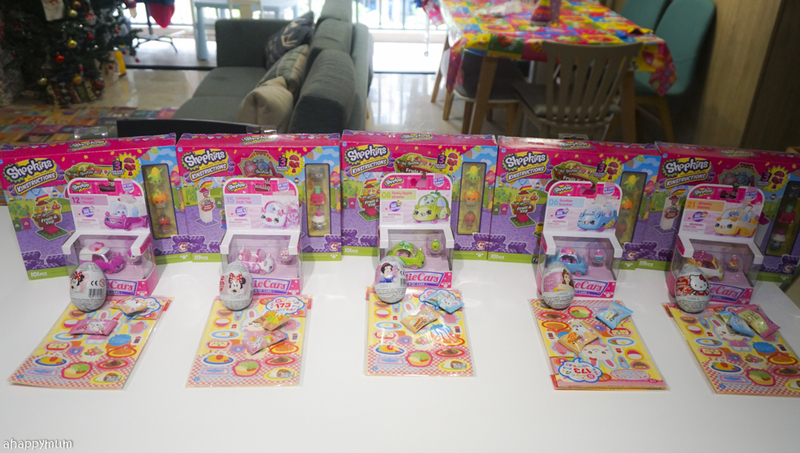 I printed out as many different Shopkins colouring pages as I could find and the girls were happy to pick their favourites! 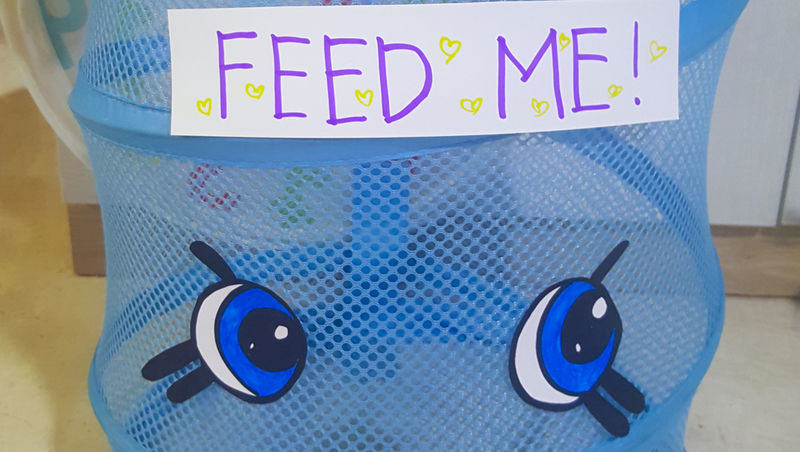 The second activity was to toss the balls into our hungry laundry basket who was dressed up as a Shopkin. Haha, you just need to add eyes and a mouth, right? All you need to do is throw 20 balls within a time limit and the number of balls you get into the basket will determine your score. The big girl, a.k.a. the game master, was a little nervous but nonetheless very excited to explain the rules to the participants and she was also the time and score keeper too. I swear it wasn't rigged but Ariel turned out to be the champion of the game with 17 points! Hooray for my girl! Anyway, all of them received this Shopkins bouncy ball to reward them for their efforts, no matter the score. This third activity was devised by the game master herself. 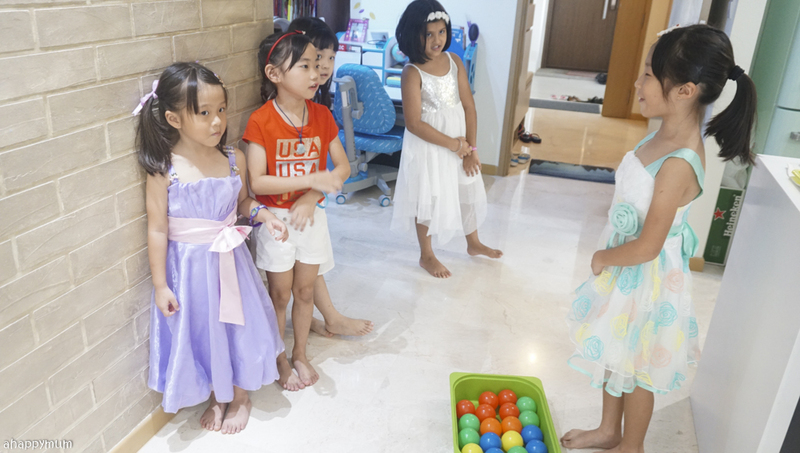 She thought of hiding Shopkins figurines all around the house and asking the participants to go around and hunt for them one by one. 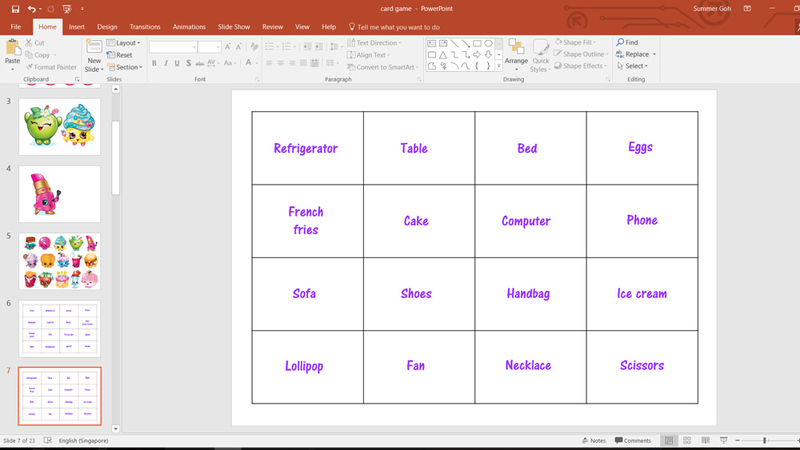 I helped her to improvise it and we decided to split the people into two teams and each team had to locate five specific Shopkins - I took photographs and printed them out as cards for them to refer to. This was a good way to teach them about teamwork and learn to work together cohesively. So, the game master hid all the 10 Shopkins in different corners of our house and the girls had to go around using their eye power to spot them one by one. You have to have an eye for detail to spot some of them! Can you see one of the Shopkins hidden below? This game was well-received by the girls who never played anything like it before and they were jumping for joy every time they found one of their Shopkins. The tricky part was when you find a Shopkin that belonged to the other group, should you keep mum or do you give them a clue? -> Guess what am I? 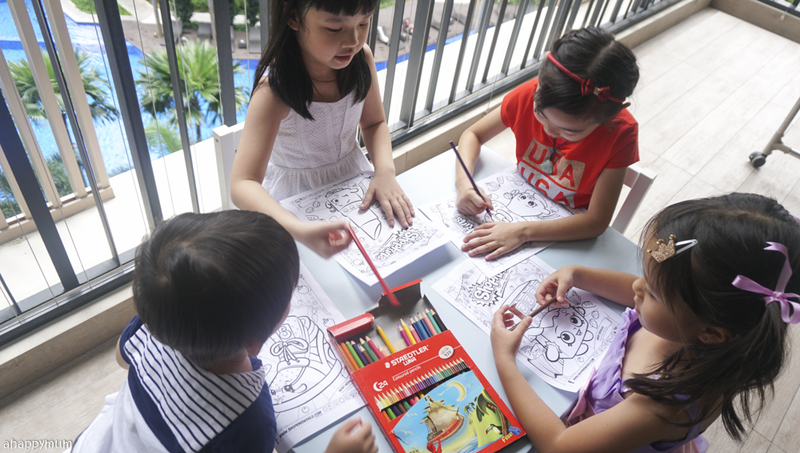 For the next activity, it's something that Ariel enjoys and that is... drawing! 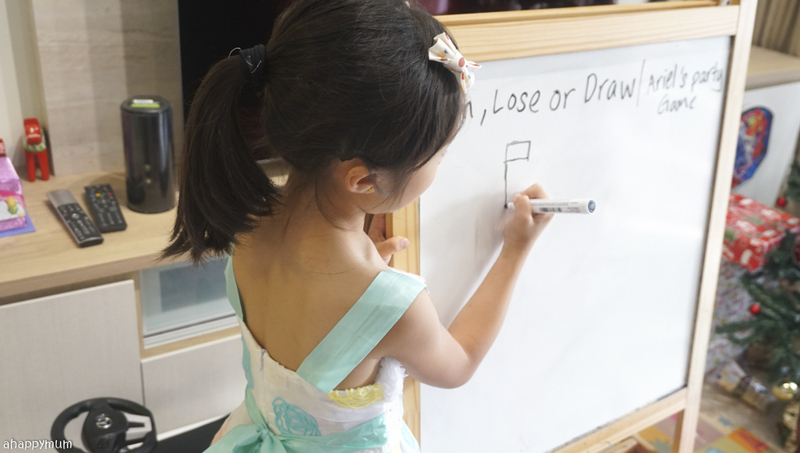 The girls took turns to draw and the rest would have to guess. 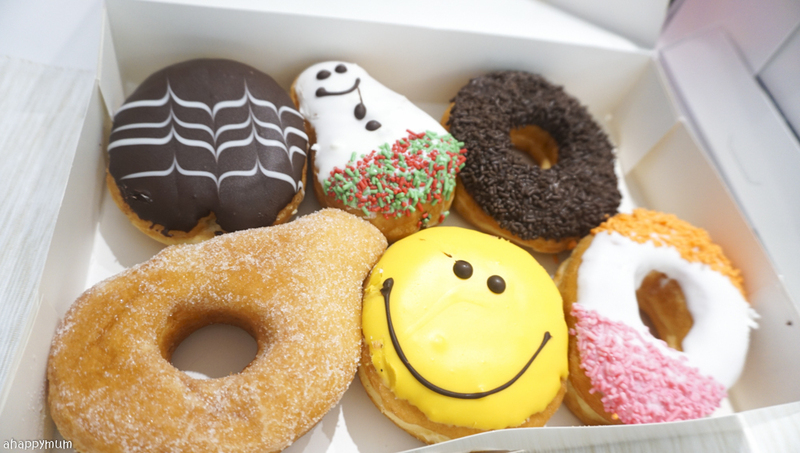 The answers would be things that you can find in the house and these can vary from necklaces and shoes to ovens and refrigerators. 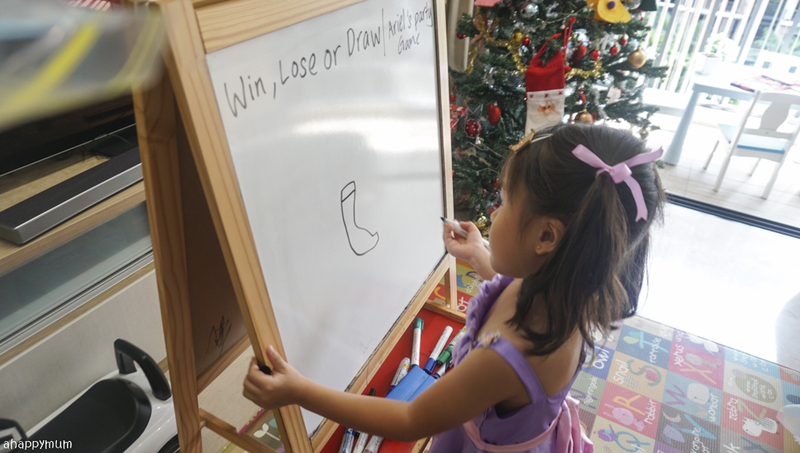 I find it a good way to help build up confidence too because the kids are usually very afraid and skeptical when they start to draw but display more confidence as they keep trying till their friends guess the correct answer. Last but not least, this was the one activity many of them looked forward to - smashing up Popsi Cool. Haha, yes, that was literally what they did. 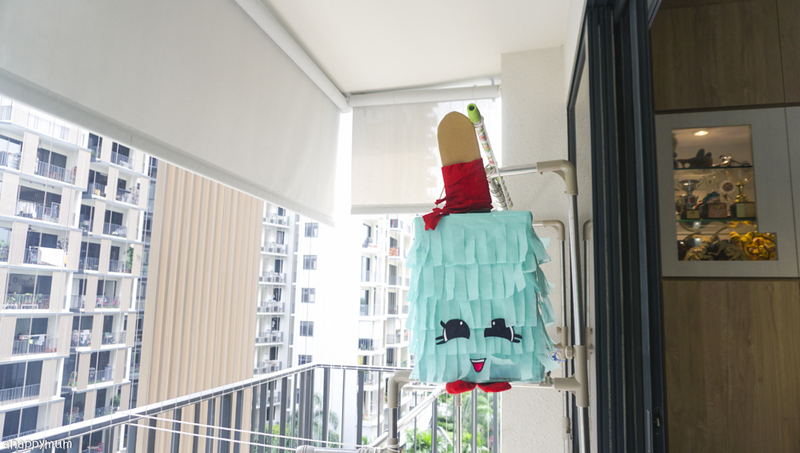 The hubby and I managed to tie the pinata onto our laundry rack with twine and adjusted till it was more or less the right height. 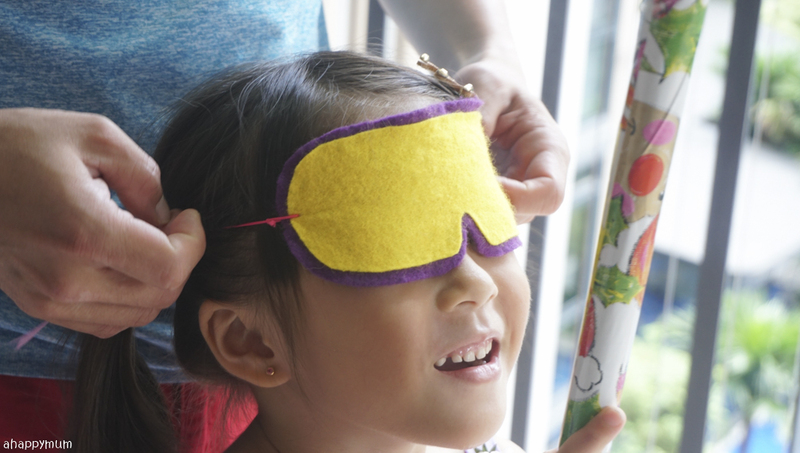 I can't believe that I still managed to find the blindfold I did for Angel's Rapunzel Party three years ago! That saved me the hassle of having to make a new one but we couldn't find the wooden sticks we used previously so the hubby and I had to improvise and we decided to use our mop sticks and wrapped them up with Christmas-y paper to jazz them up a little. Haha. Honestly, I didn't expect Popsi Cool to be able to endure a beating but it managed to stay intact and let each of the girls get a good three turns (each turn involves three hits) at smashing it. Even the big sister and the baby brother got to try it out too and everyone had so much fun! It's never so much about the treats, right? 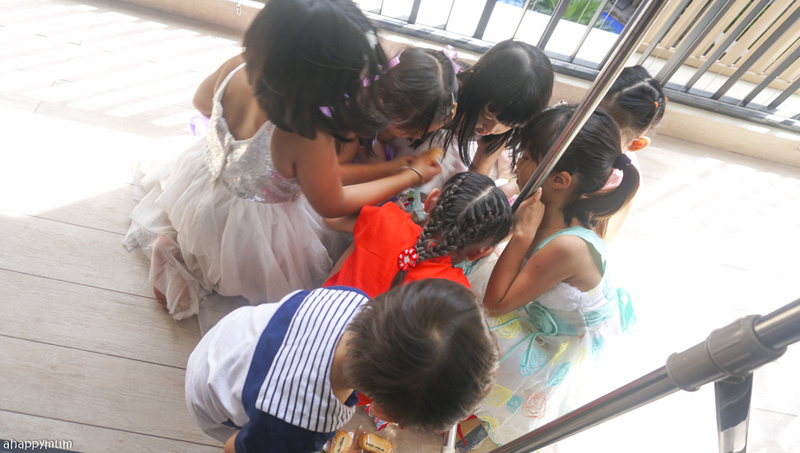 I mean, we did put lots of stationery, stickers, candies and biscuits inside but I think the fun part was actually in trying to break the pinata and sharing the laughter with your friends. 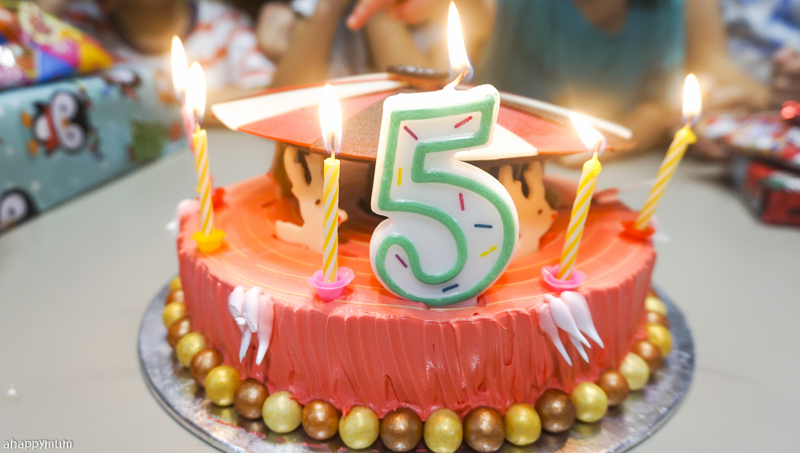 The activities, though simple, took up close to two hours and once we were done, it was time to cut the cake as some of the guests had to reluctantly leave already. 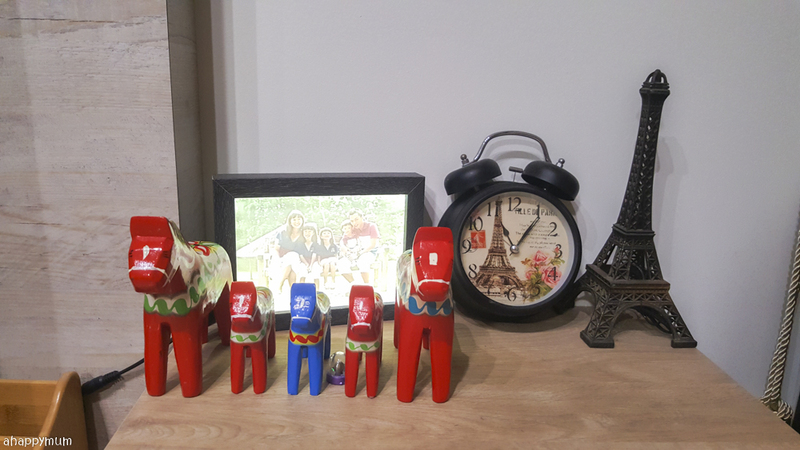 Of course, we had to take some group pictures first before saying goodbye! Here's a close up of the log cake we got from Prima Deli for her special day. We topped it up with a DIY cake topper I printed, as well as some of her Shopkins which she picked out herself. 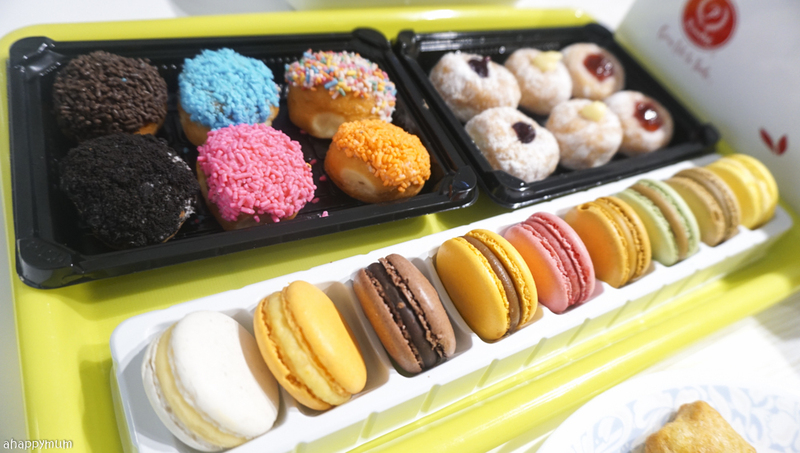 These came with holes in the bottom so all I needed to do was to insert short pieces of straw and poke the other end into the cake. Ta-dah! 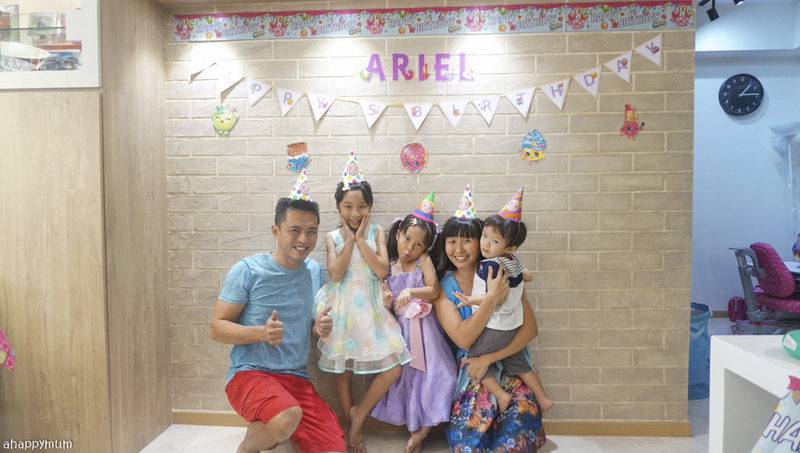 Happy turning FIVE, our darling Ariel! 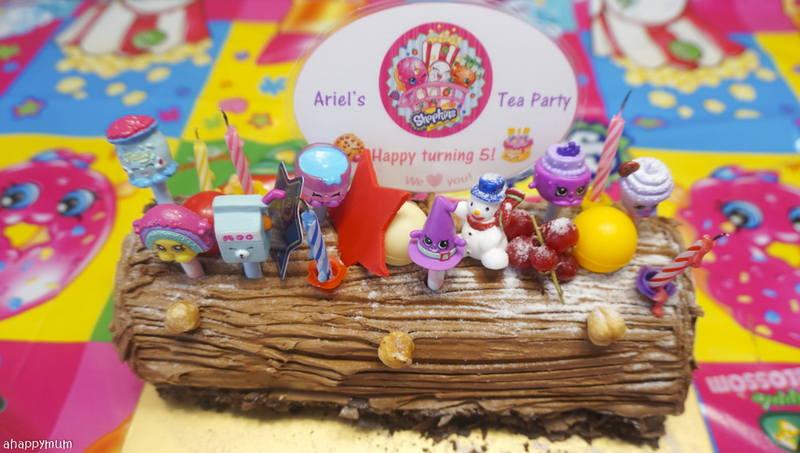 We hope you enjoyed your Shopkins Tea Party to the max and will remember these fond moments for a long time to come. Here's a big Thank You to all the friends who attended the party and helped to make this day such a memorable one for our girl. 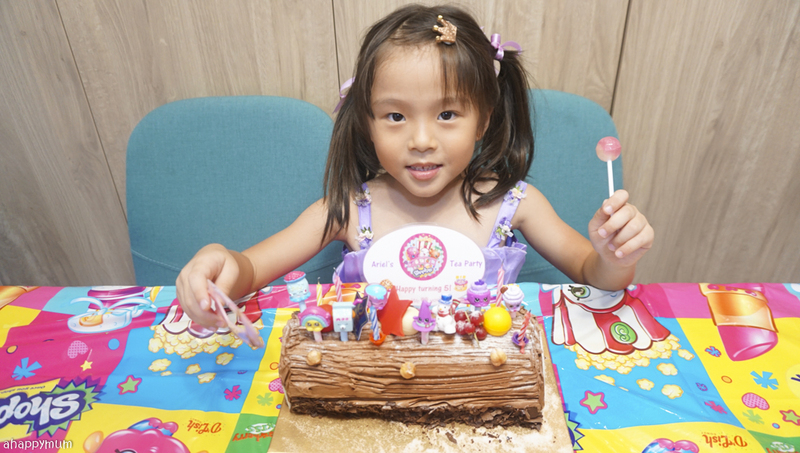 Oh yeah, this blessed birthday girl didn't just get one cake for her birthday, in fact, she had several because we celebrated in school with her teachers and classmates, as well as at home with our closest family members too. Here are some pictures for keepsake. This was taken in her school and I was so thankful that the hubby could squeeze in some time in the morning to accompany us. 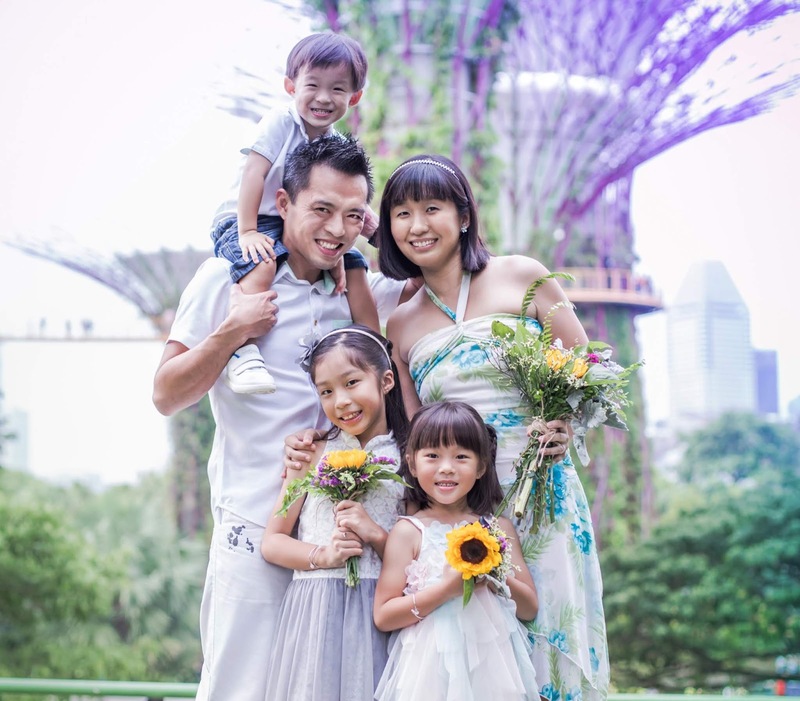 It makes a whole lot of a difference with him around and Ariel was over the moon to dress up as a princess to school that day, be surrounded by her family and celebrate her big day with her friends. 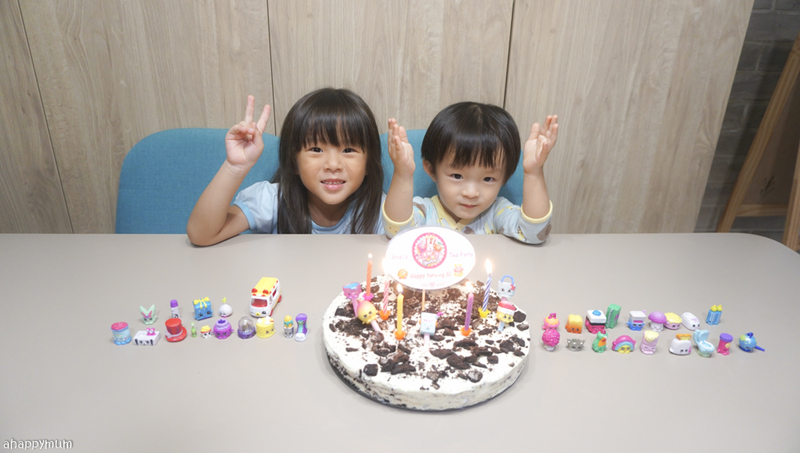 Since her birthday is only two days apart from the baby brother's, I wanted them to share a special moment together so I made a no-bake Oreo Cheesecake and let them sing the birthday song and blow the candles together. Awww, my babies are growing up just too fast! 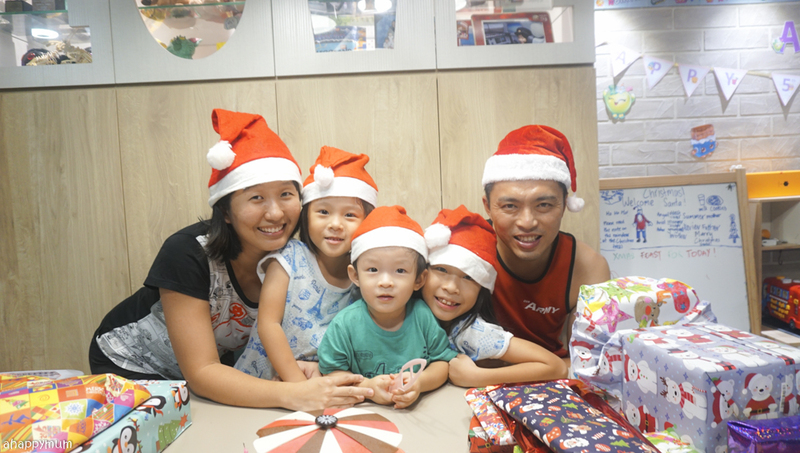 As for our family celebration, it was on the same day that we celebrated Christmas and invited the grandparents, brothers and sisters-in-law, as well as the nieces and nephews to join us at our humble house. 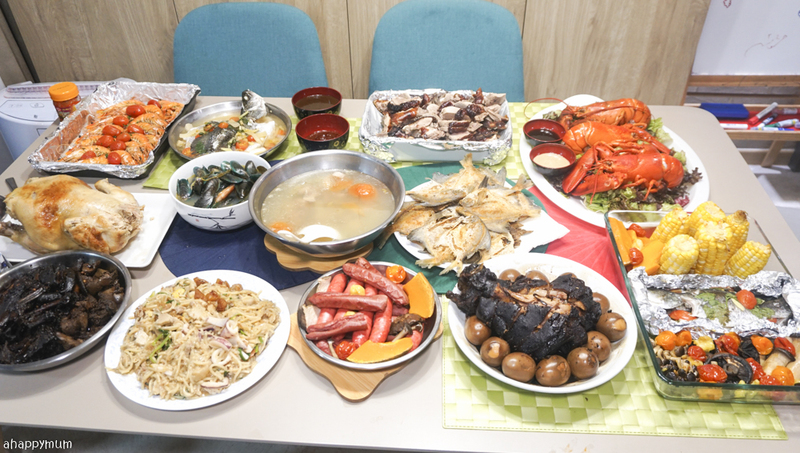 It was an evening of good food, of bonding, of joy and laughter, of love and family bliss. While all the kids were very eager to open up their Christmas gifts, we first had a cake cutting ceremony for Ariel - the last of it all. This was a beautiful carousel design cake from Prima Deli and we really loved how beautiful it looked! It felt so heartwarming to have the whole family come together and give her their blessings, and for everyone to exchange gifts afterwards and feel the love and happiness that was in the air. Yup, that pretty much marks the end of all my babies' birthday celebrations for 2017. I am so thankful everything went so smoothly and according to, at times even better than, what I had planned. It will be some time before we need to talk about birthdays again and for now, I just wanna cherish each of them before they all turn a year older. Again. I love you, dearest baby girl Ariel! May you never lose that sparkle in your eyes, that infectious laughter and the ability to brighten up anyone's day. Stay healthy, stay happy and remember you said you will love to hug and kiss Mama even when you are all grown up, okay? We love you much, always and forever!